Kundalini awakening is highly regarded and almost equally feared by yoga practitioners. Kundalini awakening may offer the yoga aspirant a first glimpse of the potential depth of human awareness. Its movement clears and widens our perceptual vision to include the radiance of Awareness as the fundamental reality of existence. Kundalini is inherently a benevolent force of evolution and in a well-toned and receptive body-mind its awakening is a gift, the grace received from diligent, wise, and skillful practice. 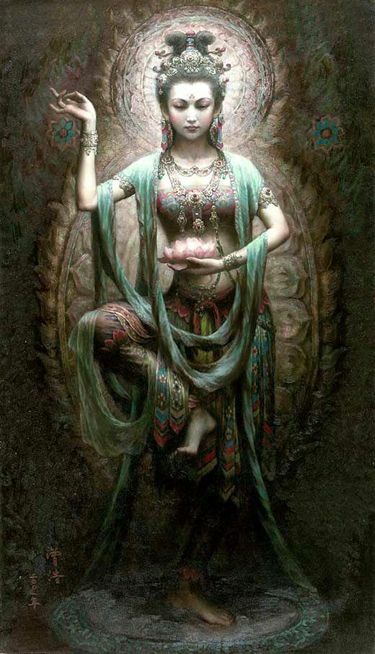 Kundalini Shakti, as this movement of life-force through sushumna is called, is the most powerful of the prana flows. The latent power of kundalini usually remains dormant at the base of the spine until the aspirant is fully prepared to handle the radiance of healing and vitality that kundalini’s movement provides. The life force of kundalini is so strong that as it rises it begins to wash away—or jar away, as the case may be—many of the obstacles to clear perception that it encounters on its way. Kundalini’s force can feel natural or harsh. It depends on the practitioner’s readiness and balance of tone in the subtle nervous system. Individual experiences vary tremendously. The opening of the channel and kundalini’s rising can be radical and ferocious, comfortable, sweet, and satisfying, or anything in between. In an unprepared practitioner, if the opening is abrupt, kundalini’s movement can definitely wreak some havoc. In an unprepared body-mind the physical effects and increased vision that kundalini ignites can be genuinely overwhelming to the individual. However, it is also important to know that kundalini awakening is a natural part of personal evolution. For most people the awakening of kundalini is gradual and mostly pleasant, accompanied by insight and an awareness of increasing depth of vision. The initial rising of kundalini may be the most noticeable part of the process. As the pathway through which kundalini flows—the sushumna nadi—is cleansed, it remains open for longer and longer periods. The periods of open sushumna and flowing kundalini are times of inspiration and clarity, a natural part of the evolution of personal consciousness. When kundalini is freed, the lucky practitioner is more likely to feel connected to his or her dharma, and becomes generally much more effective in life and work. The rising of kundalini opens the door to greater ease and satisfaction in life—an ongoing sense of knowingness and contentment. As the channel remains open, the aspirant continues to grow and develop along his or her personal life’s path toward full clarity and freedom. By far the most comfortable awakening of kundalini takes place over a long period of time. Time and regular practice of all aspects of yoga assist in making the transition to a full awakening a tender and manageable process. If one maintains a sincere and regular practice of the yamas, niyamas, asana, pranayama, and meditation, kundalini rising can be a gentle and rewarding process. Those who are patient and allow kundalini to be freed in her own sweet time will reap the rewards of their practice. Sushumna nadi is the channel and kundalini is the life force that flows within it. When the channel is open, kundalini can flow. Healthy kundalini awakening is a process that continues long after the initial experiences have died down. Once sushumna is clear and kundalini is flowing, the pace of personal evolution picks up speed. It becomes a matter of infusion. Kundalini’s life force spreads. In the beginning, kundalini is located right inside the spinal cord. It is a clear and narrow path flowing up from the lower spine and flooding into the region of the brain. In my experience the sensation of kundalini rising was very pleasant and interesting. At first I felt afraid, but the knowledge that I had gained through reading and practice allowed me to know that I was likely safe and that this was a natural part of my personal evolution. Initially the sound of the rising force was extremely loud. I resisted the experience. Realizing what was happening I decided to yield to the movement. The feeling and the sound were both very powerful as the life force reached and flooded though my brain. The feeling was comfortable enough, a crescendo of sound and sensation, a rhythmic surging, and a washing. As time went on I grew to appreciate and enjoy the experience. The surge would then pull my personal consciousness into a small point and then into complete dissolution. The individual “I” would reemerge only to be pulled back in, and so on, until the process seemed to be finished. My individual awareness resurfaced, and noticing what had happened, I would realize that my meditation for the day was finished. This experience happened fairly regularly for a number of years. I believe that the cleansing and opening of the channel was simply taking its time. I was comfortable in my life because the opening was not too fast. It was consistent and gentle, lasting over a good long period of time. My hatha yoga practice and my meditation definitely helped to open the channel and to smooth out the effects of kundalini rising. Asana practice seems to be the best way to soften what sometimes can be the agitating effects of the powerful healing and cleansing of stressful patterns that have been lodged in the nervous system for most of a lifetime. At first I was still attached to a concept of kundalini leading to a certain kind of disembodied state. I was interested mostly in the transcendental qualities of the experience, still attached to the idea of moving beyond this “earthly” existence and into a pure experience of Only Awareness. But what actually happened was that I found myself more engaged in my life. I began to feel a sense of usefulness and a desire to work and to be active in the world. This was confusing to me. I had always expected to let go of my “attachments” to life and gain a sense of freedom form the trials and tribulations that are so obviously present in all of our lives. The joke was that instead of leaving this plane I entered it more fully. Feelings became more intense. Love began to dawn into my being, but also more sadness and a resonating with the suffering as well as the joy of being alive. I really hadn’t expected this and thought that maybe something had gone awry! As time went on I began to notice something else. Growing within me I began to experience a thick tube of light occupying my entire central body from my pelvic floor to my brain. The light in the core body is the same as what is pouring through the spine. While in the spinal cord it is narrow, in the central body it is wide—the exact shape of the Shiva Lingum, an important symbol in Trantric Yoga. This reality has only continued to become a clearer and clearer awareness in daily life. There seem to be two distinct phases or aspects to kundalini opening. One is the initial cleansing and flowing within the sushumna nadi and the central nervous system. The second is a clearly felt and embodied experience of light, deep within the core of the body. Where the first one is a definite rising, the second is more a spontaneous containment that is more whole body—not reserved for the spinal cord, but fully diffused through the central body structures. There is an inherent commitment and acceptance of responsibility for containing the radiance that also grows spontaneously. There’s joy in the commitment, the joy of Shakti as she shepherds the field of form. And, as with Shiva and Shakti, one does not exist without the other. They are two sides of the same coin. In Embodyoga®, we have called this experience the “embodiment of sushumna”. Kundalini’s life force infuses every aspect of the physical and the subtle bodies and spreads through the entire personal being. It is the radiance, the Shakti, that is present in every cell—awake and bright within the core of the body. The embodiment of kundalini flowing in the personal body-mind is not a release from life. It offers and brings a full engagement in life. The question of “attachment” becomes a very interesting one indeed. It turns out that one can be fully engaged, love life, feel its sorrows and its joys without the same “attachment”. Non-attachment doesn’t mean non-involvement. Non-attachment means simply that one sees the bigger picture along with the personal. This feels like a life lived in fullness; recognition of the essence and source of life that is continuously present along with all that a personal existence brings. Pain…yes. Sadness…yes. Joy, love, spontaneity, and sorrow…all yes. Actual suffering? Not really. How can one really suffer when the radiance of life is genuinely witnessed in all of it and the continuity of Awareness is the basis of all that we perceive? A deep and thorough commitment to doing all that is necessary to recognizing life as it is. (Practice of the Eight Limbs). Faith and trust that healing can happen and there is more to life that what we commonly perceive. Meditation and embodied-inquiry into the nature of body-mind-spirit. Wise practice of yoga techniques that are appropriate to one’s personal body-mind. Deep resting practices that allow the body-mind to release chronically held patterns and stresses: meditation, savasana, yoga nidra. Hope and love based on faith and increasing direct experience. Kundalini awakening techniques that are gentle and persistent. The Axis Mundi of the yogic body, the Sushumna Nadi — known in Taoist parlance as the Penetrating Vessel — is arguably the most important of the Eight Extraordinary Meridians, which together represent the human body’s deepest, most primordial level of energetic functioning. In relation to the physical form, the sushumna flows slightly anterior and parallel to the spinal column, from the pelvic floor to the crown of the head. In relation to the energetic matrix within which the physical form appears, the Sushumna is the central portion of a torus-shaped energy-body, which encapsulates the physical in a way similar to how a womb contains an embryo. The fountain-like flow of energy up the central channel of the Sushumna expands at the crown of the head — before cascading down (in a 360-degree arc) to join once again at the root of the channel (the pelvic floor), where the cycle continues. Whereas the twelve main meridians are conduits for life-force energy (qi/chi) associated with our everyday dualistic space/time experience, the Sushumna Nadi carries the non-dual energy of Primordial Consciousness: a more refined, purified and primordial (or “prenatal”) form of qi. In the Tibetan yogic tradition, the light or energy that flows through the central channel is known as “wisdom air” — and is believed to correspond to the very subtle mind which transcends space/time, i.e. is non-dual & non-conceptual. « WHAT MAKES EMBODYOGA® UNIQUE? I was drawn to this blog entry as I have been drawn to know/explore more about this ‘Kundalini’ since experiencing my own spontaneous moments of what I now recognize to have been a Kundalini release. One occurred during the time I was studying with you in the 200 hour teaching training program. I was progressively experiencing more and more intense pain, witnessing it, and moving through limitations from constrictions in my left hip. Actually I would say I was barely able to move because of those constrictions, and I most likely was dissociating from my body/pain while directing my mind towards alignment, openness, fluidity, and peace. Every day was an opportunity to explore the effects of focused awareness, yoga, meditation, towards managing my pain and moving my body towards exploring expansion within limitation. Looking back, it would have been prudent to have had a hip replacement sooner verses later. However there was learning throughout all this. I went to lie in bed on my right side and my partner placed one hand very lightly at the base of my spine and the other up a bit further. Perhaps he moved this hand from one chakra center to another up the spine. His intuitive sensitivity to my body was incredible and he allowed me to direct the quality of the touch and the placement of his hands, while both of us tuned in, focusing on healing and dissipating the pain. I was imaging openness and flow, expansion, breathing and releasing as much as I could. I was imaging the chakras, from the root on up to the crown. Relaxed belly, open heart and throat, peering through the third eye, elevating through the crown. I could feel the gentle pulsing of what I began to feel was my Cerebral Spinal fluid. With all the pain I had been experiencing, I also gained a sensitivity to very subtle sensations in my body/mind. Suddenly there was a violent surge of, what I must now call Kundalini energy, upwards from the base of my spine. It was powerful, jolting, earthquake like, beyond orgasmic. It felt like energy just burst right up and out through the crown. It felt cataclysmic. I was left both ‘cleansed’ and exhausted. My partner also felt and witnessed this incredible process. While not destructive, it was quite powerful. I took the next day off to rest and integrate. I have had other experiences of much more gentler releases, with pulsations and vibrations emanating up the spine, more like within the channel of the spinal cord. And it sometimes seems like fluid, energy, a sense of light, a sense of love, flowing up and down, not just in one direction, and perhaps even radiating then from the heart. This has happened with and without contact with another, though touch, through breathing, imagery, ‘being’, with a sense of opening to love, peace, and the universe. Exciting. Thanks for addressing this. How beautiful, Patty! And inspiring! Thank you for sharing your experience. This post was so helpful. It’s great to have someone walking the path ahead so I have an idea of what might happen.